mopo was established in 2007, when the office was engaged by National Tourist Routes, after being prequalified among two hundred applicants. The office then won two out of two competitions for the National Tourist Routes, first the main lay-by in Persfjord (Varanger) in 2007, then a bridge and viewing platform in Låtefoss (Hardanger) in 2008. The office is working on everything from major planning tasks to detailed surgical procedures in an increasing rehabilitation market. mopo has been involved in several complex rehabilitation projects, such as the Festning Restaurant and Høymagasinet at Akershus Fortress in the city of Oslo. To realize many of the projects, the process rely on a positive outcome with the Cultural Heritage Management Office. A large proportion of mopo's production deals with the development of various housing projects. The office has worked with large housing projects, such as the competition for new housing at Moholt student campus, and smaller projects such as detached houses, extensions and renovations. The office's detached houses for two siblings (Knuts and Helens Hus) at the peninsula of Snarøya are published in the Mur+ Betong and Wall Street Journal, and were also part of the exhibition "In Therapy" at the Venice Architectural Biennale in 2016. 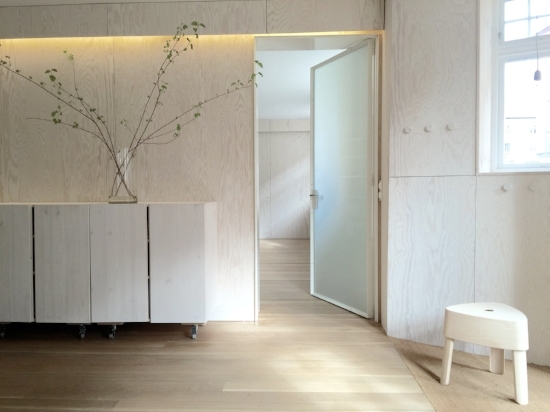 For Helen’s house, the office received the Bærum Municipality award 2015. The office has qualifications requirements for central approval, development class 3.
mopo is run and owned by Kaja Bergliot Poulsen and Siri Moseng. Siri Moseng (1973) partner, holds a Master of Architecture from NTNU Trondheim (2000) and Polytecnico di Milano (1997-1998). From 2000-2005 she worked for Jensen & Skodvin Arkitektkontor, and in 2005 she moved on to Snøhetta. Siri is an associate professor at the Oslo School of Architecture and Design. Kaja Bergliot Poulsen (1974) partner, holds a Master of Architecture from Oslo School of Architecture (2001), and a Bachelor of Architecture from Mackintosh School of Architecture (1998). She has studied landscape architecture at Landbohøj skolen in Cpenhagen. She worked for Jensen & Skodvin Arkitektkontor before starting her own practice parallel with freelance work for Carl-Viggo Hølmebakk. She has been teaching and a visiting critic at the Oslo School of Architecture.